The best way to heat a paella pan is over even heat, and given the size of paella pans, the best heat source are paella pan burners. The burners consist of two or three concentric rings which distribute the heat evenly. Each ring has its own control value giving you greater control and the ability of using only the inner ring(s) to use with smaller pans. Gas regulator hose to connect to a standard propane tank and legs sold separately. 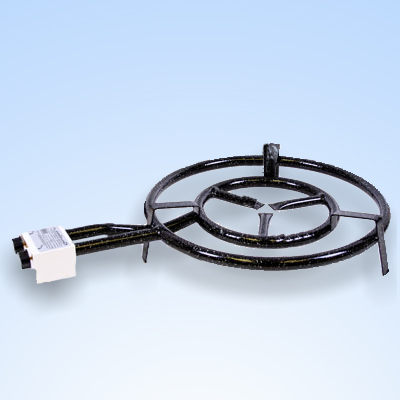 These Paella Burners use propane gas and can be connected with appropriate hoses and regulators to the same propane tanks used for backyard barbecues. As with all propane burners and barbecues, it is extremely important to think about safety first before using the burner. Make sure to use the burner in a properly ventilated outdoor area. Never use a propane burner in an enclosed area because propane gives off dangerous carbon monoxide gas which can cause a person's oxygen level to be depleted and may lead to death. Always make sure that your propane tank is not rusted and in good condition, and that there is a good fit between the hose and the burner. If you have any doubts about the connection, you can use a mixture of 1 tbsp of dishwashing detergent to 1 cup of water, and lightly pour it on the connections. If there are any leaks, the liquid will lightly bubble around the spot of the leak. Always follow the propane tank’s manufacturer’s guideline, but in any case, the tank should be stored in a cool dry location away from heat and open flame to minimize the risk of explosion. Following the simple guidelines of having a clean and grease-free burner will prevent stuck-on food from catching on fire. The best way to use a Paella Burner is on portable legs (sold separately); however it can also be used on a steady flat level surface. If the surface is not level, you risk spilling the contents due to the low profile of the pan. To use the Paella Burner, place the burner on a flat surface or floor. If the burner has wheels on the legs, put rocks or blocks of wood under the front and rear of the tires to prevent slipping. Place the propane tank next to the burner and turn the nozzle to the right to verify it is closed. First attach one end of the burner hose to the burner by screwing it in by turning to the right. Then attach the other end of the hose to the tank. Make sure the hose attachments are tight and secure. It is advisable to light the burner before placing the pan on it. You can then place the pan right on the burner on the pan supports on the burner itself. To ignite the burner, it is best to use long fireplace matches, or long butane barbecue lighters. Starting from the inner ring first, bring the fire source close to the base of the ring. Slowly turn the gas knob that controls that ring counter-clockwise until the fire ignites, the fire will then begin to travel around the ring until it is fully lit. If you turn the knob on too fast, it could either burn you or the flame on the match will go out due to the strong gust of wind. Adjust the flame at the burner control, and repeat with the successive rings. Make sure to keep fingers, arms, face and other body parts away from the burner during the ignition to reduce the risks of burns and serious injury.